R and Julie live in chaos and upheaval. Normal for them would be considered absolute horror for the rest of us. Cataloging whether someone is completely dead, almost dead, or living is part of their every day. Throw in the fact that they are in a daily fight for survival and it’s not exactly what you could call ideal. But they make it work and together they have carved some semblance of a life. It’s an existence and for R (who remembers being dead not so long ago) it’s as close to heaven as he’s sure he’ll ever get. Unfortunately, life rarely allows any of us to get comfortable without throwing a curve ball. A new corporation is on the scene and they are claiming that they can bring everything under control and fix the chaos. They are huge and far reaching, with branches across the country. Despite all the promises made by this new entity, R and Julie aren’t impressed. When one of their friends gets ‘eliminated’ after showing concern about this corporation, our favorite ex-zombie and his lover find themselves on the run. 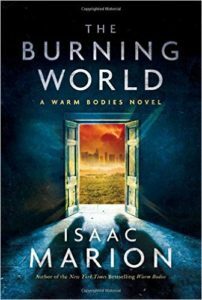 I almost skipped Isaac Marion’s first book, Warm Bodies. You see, I am not a zombie fan. Or a horror fan. Or a supernatural fan. I have read vampire books in the past but they really aren’t my speed. So a zombie love story crossing my desk? Ehhh, not so much. But at the urging of Jake Chism (the previous owner of Fiction Addict) I went ahead and requested a copy and I am so glad that I did. Warm Bodies was so much more than the sum of its parts. Zombies aside, I found the book to be an amazing journey that explored so much more than your typical zombie picnic escape. It delved into philosophical issues. What does it mean to be human? What should you do with someone else’s memories? Oh it was so good. If you’ve seen the movie and not read the book yet, you are totally missing something amazing. So it was that I attacked this book with some serious passion. After writing to Isaac and begging him to get me a copy, I was so ready to get back with my friends R and Julie. And I was not in any way disappointed. I adore Isaac Marion’s brain. (Not in a creepy zombie way either – although if I were able to get some of his talent by…no. Let’s not go there.) The way he strings together words and sentences to breathe life into this story will never cease to amaze me. In fact, I have a confession to make. I made notes in the margins of this book. I highlighted and underlined and put little hearts. Cause his writing is JUST THAT GOOD. Seriously. This book, though a beautiful fictitious adventure, also showcases incredible depth of thought and use of language. It should be used as a text book in writing courses. Now I’ll be honest. This wasn’t a slow, simple, fast read. Though I do love those books (I call them bubble gum for the brain) this isn’t one of those. In fact it took me quite a while to get through it. I owe Isaac an apology for taking so long with it but the fact is, I wanted to savor it. There was no place in this book that I skipped over to get to the ‘next good part.’ Oh come on – we all do that don’t we? We see a long paragraph of description and we skip over it to the next big action part? In this book every single line must be tasted. Savored. Many of them bear repeating. And quite a few of them beg to be read out loud just to hear how the words sound in spoken language. The story of R and Julie is still haunting, gorgeous, beautiful, and fraught with danger and chaos at every turn. If you haven’t yet read Warm Bodies, what are you waiting for? And if you have read Warm Bodies but didn’t pick this one up yet? Get thee to a bookstore immediately. You don’t want to miss a single page of this adventure.